Wara, a place in Kwara state, Nigeria: 8°25’60” N; 4°27’0″ E and 305m above sea level. Wara, food. Poor man’s cheese aka Nigerian Tofu, made from soya beans. Wara, food. 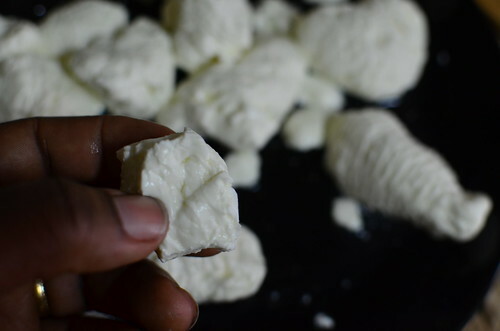 From Kwara state, fresh cottage cheese/curds made from milk. And currently formerly in my possession. My cheese curds arrived half way between saying goodbye to neighbours moving to Brunei, and getting the children ready for bath-time, dinner and school on Monday. S, my friend and roomate in Utah and Colorado had been home to Kwara state in Nigeria’s west, one of the 36 states in Nigeria for her grandmum’s funeral. She’d told me about ‘Wara’ many times, and promised to bring some back for me on her next trip home. She made good on that one. Two small bags of white curds, swimming in whey awaited me. My first peek made me think of gnocchi, complete with grooves and ridges, as though made on a gnocchi board. I would have thought of bees had the curds been yellow but gnocchi was what came to mind. Cheese curds are little known in locations without cheese factories, because they should ideally be eaten within hours of manufacture. Their flavor is mild, with about the same firmness as cheese, but with a springy or rubbery texture. 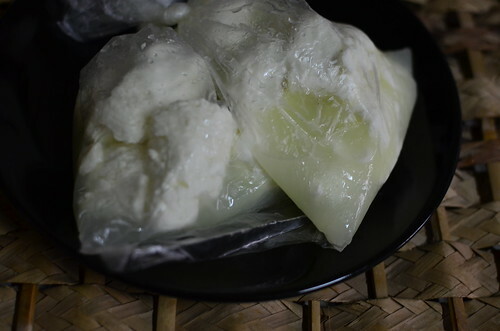 Fresh curds squeak against the teeth when bitten into, a defining characteristic, due to air trapped inside their porous bodies. They are sometimes referred to as “squeaky cheese”. The New York Times describe this as ballons trying to neck. They squeal, most volubly within a day of their making, we learned, because their binding proteins are still superelastic, like new rubber bands. Gnawing on sample curds on the bus ride home, I marveled at their sound: balloons trying to neck. It turns out that this cute basket moulds are what give Wara its classic, ridged cone shape. S gives me tips on how to eat them: fresh, boiled and deep-fried. My friend’s mom gives me even more tips. Boil in salted cold water. Once hot, and boiling, take off heat, strain off curds, discard water and deep fry curds. Enjoy on their own, or in soups and stews. My plans are slightly more varied. 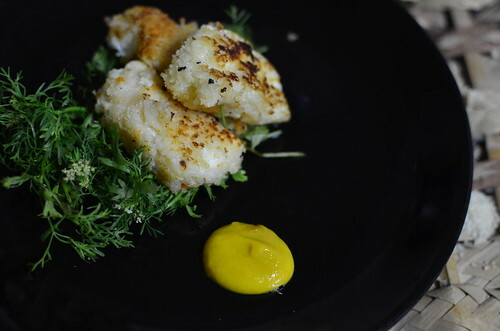 I think chilli oil, I think crumbed and deep-fried, dunked in a cheesy-beer sauce, and with lots of shaved Meyer lemon. The manufacture of Wara cheese is widespread in Nigeria and a similar cheese called Wogachi is made in the northern provinces of Benin republic, a French speaking country to the west of Nigeria. The Fulanis of Northern Nigeria are traditionally cattle rearers and they have access to fresh milk from Zebu Bos indicus cattle. 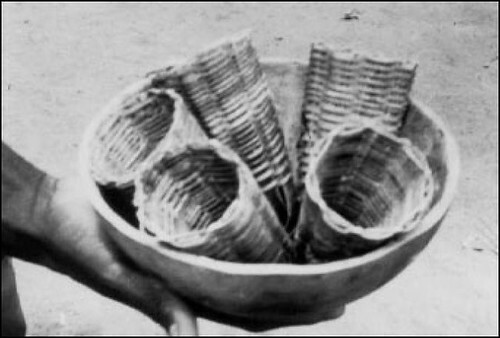 Wara cheese making is thought to have started in this region and as a result of the nomadic lifestyle of the Fulanis has spread to other parts of Northern Nigeria, Kwara, Oyo, Ogun, Ondo states; and the Benin republic. …….The milk is stirred gently during the initial and subsequent heating and cooking, the Calotropis procera juice extract is then added to the warmed milk. The milk is heated slowly with intermittent stirring until it reaches boiling point. The milk is kept at boiling point until it coagulates and when there is a visible separation of curds and whey it is immediately removed from the ﬁre. The curds and whey are ladled or poured into baskets. 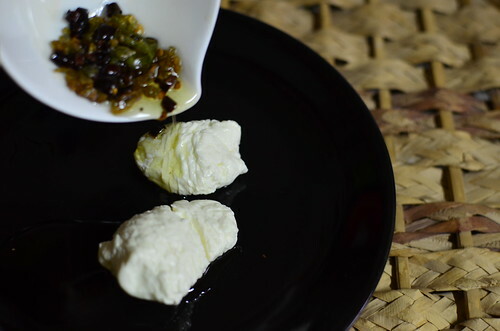 The Wara looks like Buffalo Mozzarella, but it isn’t as elastic, and it tastes herby, thanks to the leaves of the Calotropic procera, also known as Apple of Sodom, which is both the coagulant, the thing that causes curds to separate from whey and flavouring. It is squeaky on the day it arrives, but till I’ve been to Wisconsin and back, I cannot be the judge. All I can be is taster. Ladies and Gentlemen, here is Wara, three ways. This was the very first thing I made with the Wara, after trying it plain. 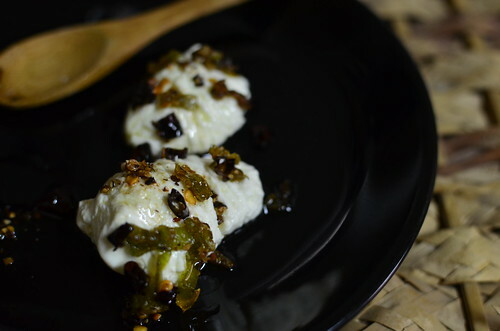 I knew it needed some spice to lift it beyond nice and creamy and this was really wonderful – the crisp, fried chillies played on the soft, creamy, slightly herby flavour of the curds. Homerun #1! Be sure to open doors and windows, (in case you -over-fry- the peppers) or turn on your extractor. Place a wok or skillet over high heat. When it is hot, add the oil and swirl to coat the pan. Toss in the dried chiles, jalapeño, and peppercorns and stir-fry for 30 seconds – 1 minute till you smell the fragrance of the peppers. 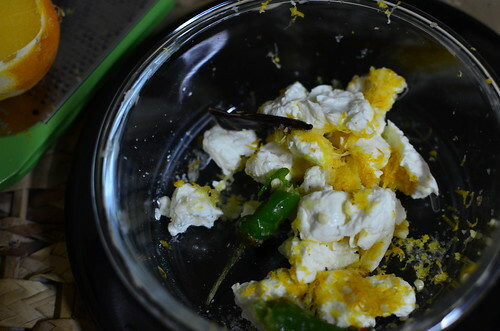 Watch this stage for it could quickly transition to the fragrance of burnt peppers. . Sprinkle on the salt and mix well. Serve with your curds. Verdict: Yum! 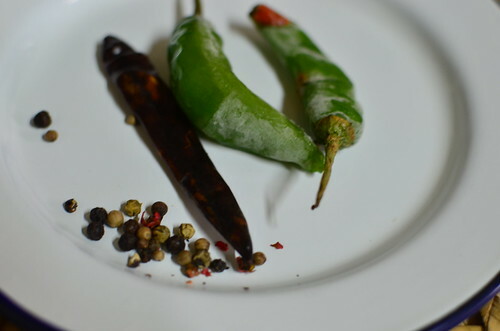 The chilies become crisp, the fragrance embraces you in its warmth, and the oil is light and spicy and perfectly salted too. This is dinner, this cheese and peppers and it is delicious and beyond. A keeper for the next round I receive! You may not know it but I’m in LOVE with Meyer lemons. In fact, I have a whole series of posts coming up – ‘Seven days with Meyers’ :-), or something like that. 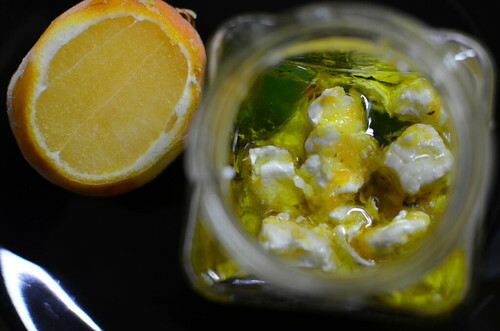 This was simple – the curds were combined with micro-planed ‘frozen’ Meyer lemon, a la Norma, chopped green chilies, salt and topped with olive oil. I left it to marinade refrigerated overnight. Ready and perfect for an office lunch. 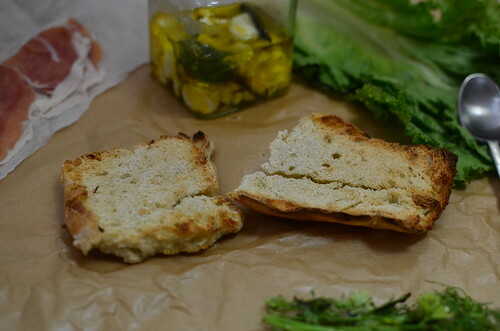 Homemade French bread, on a brown paper tablemat! Lunch was indeed parfait! 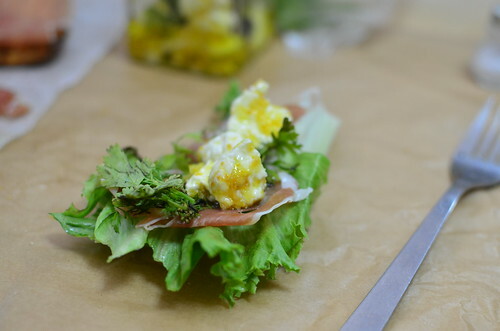 An open face sandwich of lettuce, proscuitto, wara and fresh coriander leaves. All in balance – creamy, salty, herbed. Loved, this was…by me. 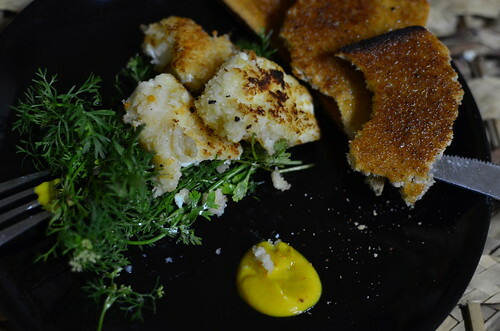 And finally, dinner that evening was panko-crusted Wara. This is a technique I’ve tried with Mozzarella with great results. Crisp, golden crust surrounding warm, melted cheese…..who hates that? Not me! Served with some cilantro and a dollop of mustard. And assisted my some buttered brown toast. This was a very delightful experience for me – discovering that Nigerians have cheese. And while we’re not yet on the Italian scale, we’re getting there!